The last Climate clippings was back in March 2012. I’ve decided to start it up again, so we’ll see how we go. What I try to do is to include up to eight entries with an average of no more than 125 words. Readers who want to keep up in a general way should be able to gain a basic understanding by reading the entries without following the links. This time the entries blew out to an average of about 150 words. Climate clippings also serves as an open thread to share interesting links. Announced at Skeptical Science as a new Guardian blog, John Abrahams and Dana Nuccitelli will be writing at Climate Consensus – the 97%. It does have comments, but to me is not formatted like a blog. Maybe a newspaper blog. It really started on 24 April. So far it’s not high volume, but looks interesting. Nuccitelli blogs at Skeptical Science as dana1981. The new blog is targeted at a more general audience. It appears their output is going to include correcting the errors and myths of the climate change contrarians, which is welcome. A new report from the Centre for Policy Development recommends that Australia fully embraces solar energy as a hedge against volatile gas prices, and future electricity price shocks that could be caused by drought. The report says rooftop solar can save consumers money, gives them real choice, improve competition and help address network problems. 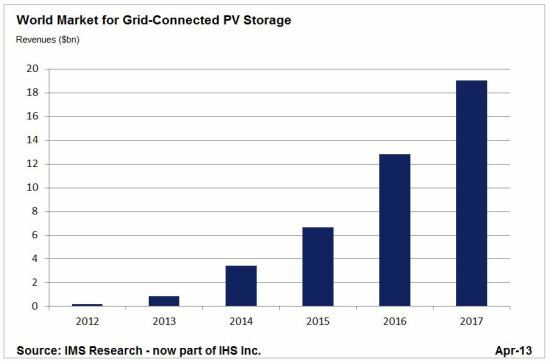 Already, one million homes have rooftop solar PV, and at the very least a million more should follow in coming years, even without high incentives that assisted the initial take-up. It notes rooftop solar should play a key role in the transition of Australian electricity system to a “cleaner and affordable alternative”, but it warns that the technology would likely face fierce opposition from powerful interests seeking to protect their legacy assets, who are seeking to exploit a political divide over renewables. We should maximise rooftop solar uptake, the report says, but in Oz in 2012-13 support for existing coal-fired electricity was $3.6 billion per year, compared to $1.4 billion for renewable energy. Recently we looked a electricity prices and the possibility of 100% renewables. The energy giants China and the United States are accelerating action. China’s efforts demonstrate accelerating global leadership in tackling climate change. The United States has made a new commitment to lead. 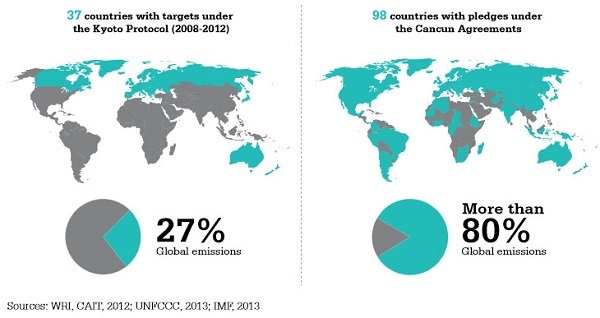 Global momentum to tackle climate change is growing. Every major economy is tackling climate change, setting in place policies to drive down emissions and increase investment and capacity of renewable energy. Australia is a major player and is important in shaping the global response to climate change. If you are wondering what the UFCCC is doing about climate change, the simple answer is they are having lots of meetings as their schedule shows. Currently the Ad Hoc Working Group on the Durban Platform for Enhanced Action (ADP 2) is meeting at the Bonn World Conference Center in Germany, which seems to be the UNFCCC’s second home. According to the press release they are working on the platform for the new agreement to be reached by 2015 for implementation from 2020, as decided in Durban in 2011. The Bonn talks are going well, according to the Irish Times, but we won’t really know until the Conference of Parties (COP) annual bash, this time in Warsaw in November, when the politicians show up. Meanwhile you can monitor happenings at the UNFCCC site and rejoice that Ethiopia plan to go carbon neutral by 2025. 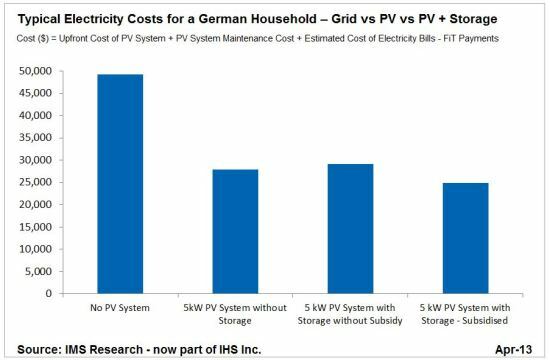 As costs of the new technology come down and grid electricity prices go up, future PV storage should be cost effective even without subsidies. The IMS press release is here. If you thought wind power generation was a mature technology, here’s a couple of developments of interest. GE, now ranking with Vestas as the biggest maker of wind turbines in the world, has announced that it will supply three wind turbines with battery storage using 50kWh sodium nickel chloride batteries, as part of an 86-turbine order for a new Texas wind farm. GE says its modestly named 2.5-120 Brilliant turbine will incorporate short-term power-storage capabilities, using software to analyse wind speeds and batteries to retain excess power during gusty periods so that electricity can be fed into the grid when wind declines, thus smoothing the output. The hope, according to an article in Quartz is to for every wind turbine to became a node in an energy internet, communicating with the grid and each other to adjust electricity production while storing and releasing electricity as needed. the world’s most efficient high output brilliant wind turbine. The first wind turbine to combine world-class efficiency and power output at low wind speed sites capturing a 25% increase in efficiency and 15% increase in power over GE’s 2.85-103. In case you missed it here is the link, courtesy of Jumpy, to to new solar-wind hybrid power plant which should roughly twice as efficient. Any business that ignores this opportunity either as a driver or consumer participant is failing its owner/shareholders. Great presentation Brian, vitally important information. Thanks, BilB, I’ve corrected the post. If Labor is looking for a point of difference between them and the essentially denialist LNP throughout the country they could do worse than give a higher profile to their climate change policies. Brian, giving political advice to the ALP these days is, I don’t know, the analogy escapes me, but it’s painfully pointless. Thanks for resurrecting climate clippings. That odd mix of optimism and hopelessness. Western Victoria has the driest six months on record and little likelihood of much improvement. Considering the events during the last decade here even the most cynical deniers are wobbling. Good to see climate clippings back Brian. If your starting a Global warming cherry picking competition can I play? BilB @ 3, that’s an amazingly simple concept. Wilful & John D, I’m hoping I can keep it up. Jumpy, for starters, people’s ideas about climate change are influenced by the weather, rightly or wrongly. So they might end up believing the right thing for the wrong reasons. Deniers believe the wrong thing for the wrong reasons. But you should check what scientists are saying about the lack of rainfall in that region. Jumpy, for starters, people’s ideas about climate change are influenced by the weather, rightly or wrongly. So they might end up believing the right thing for the wrong reasons. I can’t believe an honest man could advocate such a position. That is exactly why the distrust of ” warmists catastrophe ” is growing. in my view, the two wet years were the departure from the norm. We’re back into the dry phase it looks like, but perhaps as not as dry as earlier because humidity has not dropped back to pre 2008 levels. On the subject of innovation and progress in cheap accessibility to production systems involving solar panels ( or anything else ), the advancements in 3D printing is the future. Jumpy @ 9, you should read carefully what I write. In an earlier post I linked to some material about opinion. From memory one mob found that recent weather affected people’s opinion on AGW to the extent of about 5%. That’s all I was referring to. I wasn’t advocating anything at all. Strictly off topic, apart from 12 minutes after half time, the Broncos won. That’s true! But if I used those facts to say the Broncos were the better team I’d be cherry picking. Jumpy, you should read section 3 of the recent Climate Commission report on extreme weather. Reference is made to the likelihood of greater instances of both heavy rain and drought. For both southwest and southeast Australia, nearly all of the climate models used in the study project a significant increase in drought by the end of the century (IPCC, 2012). That’s what I had in mind with my original comment. People experiencing dry weather may read that and feel that their experiences accord with what scientists are saying. My own view is that I note what happened in the Millenium Drought of 1997-2009 in the southeast of the continent and what the models predict, but modelling on a regional basis seems to be quite tricky and decadal and longer anomalies do occur. The evidence on temperature is more compelling. As a betting man I would be with Roger @ 10, but I’m not a betting man and I don’t know what odds I’d put on it. On item 4 of the post, UN action, try here, here and here. The shorter story is that if you want the US in, and everyone does, then it’s going to be a weak agreement with each nation setting its own goals. Reality finally sinking in regarding this scam! David Whitehouse is an idiot who can’t even read a report properly. You are clearly lying if you claim a “standstill” is the same as a decrease in temperature, or have so little idea about anything that you can’t be relied on for an accurate assessment of anything. Mk50, it seems you missed this post. I’d prefer it if you took your tired tropes elsewhere. The Global Warming Policy Foundation consists of the usual suspects. Hey, I am not the one who still believes in the hockey stick, or that the IPCC is not a political entity with its snout deep in the trough. That’s the problem of one being scientifically literate, you see. It allows one access to data which Gaian religious cultists cannot permit themselves to look at, let alone understand. The glowball warming scam is so 1990s these days. Flanners has gone from $50k a speaking gig all over the world to… no paid gigs at all, poor chap. And ‘climate change’ and ‘climate chaos’ are getting no traction any more. And still the true believers in the cult bang their drums and rattle their bangles on street corners – it is highly amusing entertainment to watch desperate AGW cultists wailing against the disappearance of the limelight, and the realisation that they have been gulled by expert con-men. Al Gore’s a billionaire now, with his own private jet. It was only ever about the money, he’s got it, and the little people who still believe in his cult do not matter to him any more. As I said, hugely entertaining to watch. Just as it was in the 70s with the overpopulation and global cooling scams, in the 80s with the acid rain and chemtrails scams, 90s with the frankenfoods scam etc etc etc. There are always cashed up gullible people to scam. The trick is not to be gullible. Wow mk50 you are so out of touch with reality it isn’t funny. Well it is, but it isn’t if you get my meaning. i try not to laugh at stupid people, but you’re making it hard. MK50’s contribution shows little evidence of actually having read any of the substantial scientific literature. His ad-hominem commentary on personalities substitutes “playing the man and not the ball” for serious engagement with the evidence. Very sad. Who is this bozo from the Russian Academy of Sciences’ Pulkovo Astronomical Observatory – with some trumped-up title of “head of space research” – with the absolute crass gall to say that a decline in solar irradiance is cooling the planet, and possibly sending it on the way to another ice age? How dare he attempt to contradict scientific minds of the calibre of Bob Brown, Christine Milne, Peter Garrett, Julia Gillard, Greg Combet, Simon Sheikh’s squeeze, Kochie and Steve of Brisbane? The hide, the nerve, of it all. And shame on The Australian for publishing it. What would some vodka-addled Russki know? That’s the hate media for you. When Abbott666 gets in, there will be no stopping this sort of thing. There is nothing checking one’s information before exposing oneself. According to this information your Ruskie might be an imaginary scientist. It seems that the range of the solar sun spot activity is less than a quarter of the effect of global warming. Here’s a video from those commos at NASA.